Scott Hutchinson aka Bright Boy, has been a sidekick since he was little. Now in middle school he's outgrown his Bright Boy outfit, yellow tights and red cape. In the opening scene, after saving a woman from a kidnapper, the tights show Scott's excitement and its caught on tape. Now everyone is making jokes at Bright Boy's expense. Bright Boy is the sidekick to Phantom Justice. Supervillain Dr. Chaotic has escaped from prison. Now Phantom Justice and Bright Boy must face off against Dr. Chaotic's and his sidekick Monkeywrench again. After the sidekicks accidentally discover each others identities, Scott begins to second guess his secret identity and hate his inappropriate outfit even more. From the beginning Ferraiolo pokes fun at the superhero world, with the cliched saving of a beautiful female hostage. Phantom Justice takes himself a little too serious. The hero/villain scripted banter is hilarious. Scott is a great character and the perfect guide into this superhero world. I expected the action and humor, both were great. Scott having a love interest was a pleasant surprise. 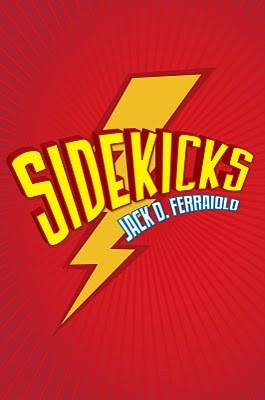 I loved the author's first book, Big Splash and was really looking forward to Sidekicks. I was not disappointed, this was so much fun and very well done. Ferraiolo simply brings it every time. There aren't that many tween or YA novels featuring a male protagonist with a romance storyline and the author pulls it off with ease. It's simply another layer in this well told and very funny story. 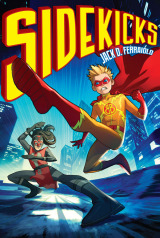 I really like the Sidekicks cover. I read a galley, this was the cover. I didn't think it did the book justice or would help sell it. So I am very glad they decided to go with something else. Chad W. Beckerman, art director at Abrams discusses the evolution of Sidekicks Jacket.